Have You Got The Blue Screen Of Death ? Black Screen With flashing Cursor ? The sight of the Blue Screen of Death is one of those that makes you hold your breath. Do not worry, not all blue screens warn of disaster. Sometimes it is a one off. To be sure press and hold the power button for 5 seconds to switch the machine off and try again. What Should I do Know ? 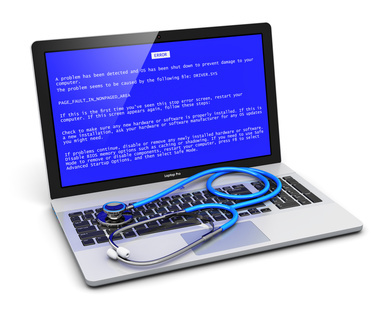 Some blue screens are caused by hardware changes, some hardware problems, some are simply a software problem or clash. It could be that there has been a driver update and for some reason this hascaused Windows to fail. Most of the time it is unlikely to be a failing hard drive. So all your pictures and documents and music are still on the drive you just cannot get to them. Breath a sigh of relief and call Computer Rehab. Most of the time we can recover your important files and repair Windows, Panic Over. There are occasions when it is a hardware problem but we can Diagnose the problem provide you with suitable options and advice on what to do next.